When you think of blinds, you might think that they are unappealing, or worse, you might overlook them completely. 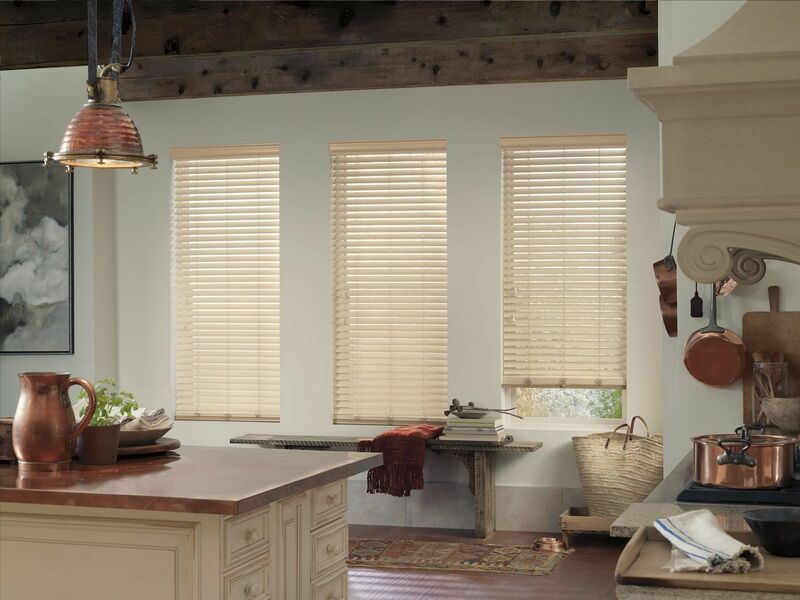 At Cadillac Window Fashions, we show them in a new light by offering a wide selection of gorgeous blinds. Some of the most popular options that we offer include vertical blinds, horizontal blinds, and they come in a variety of materials from wood to plastic to even fabric. This gives you infinite potential and at Cadillac Window Fashions, we are determined to help you pick a look that will stand out in each and every room. Blinds are a wonderful option because they offer privacy and give you full control of how much light to let in. Trying to watch a movie in the middle of the day or want to sleep in a little longer on a Sunday morning? Close the blinds to block the light completely, giving your room a more movie theatre atmosphere or just the appearance of night-time. In addition, you can have them open to expose the light into your house on a beautiful sunny day. This means less electrical costs and allows the beauty of natural light to illuminate your entire house. The possibilities are absolutely endless when it comes to blinds! In addition, blinds are extremely energy efficient. Living in a big city such as Toronto can get rather expensive so whenever there is a chance to make your house look gorgeous, while saving money, it is definitely worth considering! Blinds create an extra layer of insulation which reduces unwanted heat in the summer while retaining it during the winter months. This is perfect for the harsher winters we have been experiencing in the GTA as blinds provide the perfect opportunity to let the light in while blocking out that unwanted cold weather. The look of blinds also creates a beautiful and inviting atmosphere, adding warmth to every room. Lastly, the ease of maintaining your blinds is one of the reasons why they are an ideal option for any home. All it takes is a simple and quick wipe with a damp cloth and all dust is instantly removed. Unlike curtains, blinds do not need to be washed periodically. They can also prevent UV lights from entering the house which keeps all furniture in the room from discolouring due to prolonged exposure. Blinds are a long-term investment as they are durable and therefore will not be easily damaged by rambunctious children. Worried about your kids playing with the cord and causing potential for it to break? No worries, as Cadillac Window Fashions offer both cord and cordless options. Their durability means that they will last for years and will be a staple in any home. At Cadillac Window Fashions we provide a vast selection of vertical and horizontal blinds, in a number of different patterns and fabrics. We guarantee that our expert staff will be able to offer and install a design that will look outstanding in any home throughout Toronto, Woodbridge, and the GTA. We value your satisfaction and will ensure that the proper blinds are chosen for your particular home, room or office. Visit our website today to see for yourself just how beautiful our blinds selection is!